Such a wonderful title! Can you not immediately sense that wistful end-of-season atmosphere, the unfamiliar chill in the air, the damp and the mist rolling in from the sea, the evenings drawing in? Autumnal daylight and earth-scented evenings. Very northern hemisphere, very evocative. A winning start. 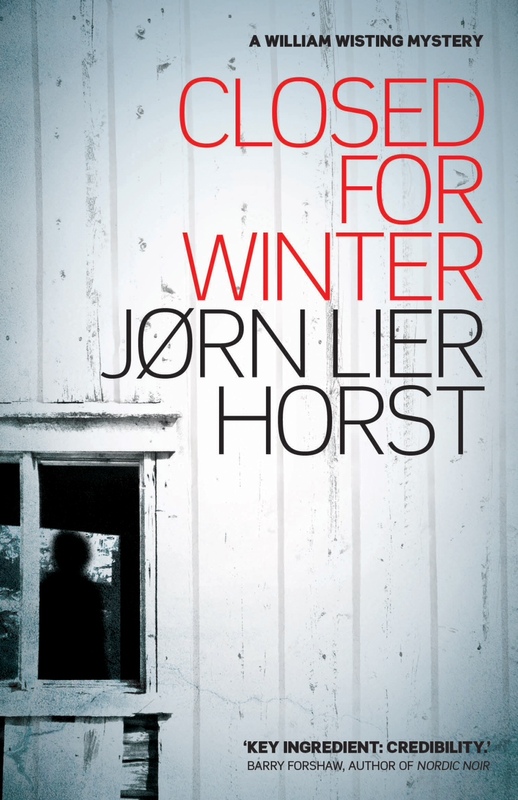 Then there’s Jørn Lier Horst himself. He’s a real policeman, in Larvik in Norway, a wholesome southern township renowned for its natural spring water and for being the birthplace of Thor Heyerdahl. Horst’s fictional alter ego is homicide detective William Wisting, and this is Wisting’s seventh outing. 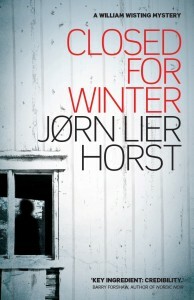 Closed for Winter won Norway’s Booksellers’ Prize and was shortlisted for the Riverton. There’ve been two more Wisting detective murder mystery books since this one was first published, the former of which, The Hunting Dogs, also won prizes. So here we have a successful, acclaimed, authoritative author who knows his material inside out. He’s good on the autumn setting too, many chapters beginning or punctuated with rain, fog, fallen leaves, haloes around street lights, wet cobbles and dark clouds overhead. It would make wonderful telly and perhaps it will. Scene-setting is one thing; moving the plot along is another. In and around Larvik the storyline develops convincingly, but it loses focus somewhat when the action shifts toLithuania. Wisting has a daughter, Line, with an unsuitable boyfriend, Tommy. Line is a crime reporter, a role which gives verisimilitude to her involvement in Wisting’s cases. The father-daughter relationship is perhaps the most interesting element of the plot, woven in and out of the deaths, blood, drug deals and whatnot which make up Wisting’s daily business, but where else in Nordic detective fiction does a tricky father-daughter relationship run through the drama, volume after volume and on our television screens, hmmm? Perhaps it is inescapable that less well known writers of detective fiction will be measured against the likes of Henning Mankell (whose detective Wallander has a complicated relationship with daughter Linda) and Jo Nesbø. All the same, Wisting and Line give us the nearest to character development this tale offers, and the passages where the telling is most accessible. By contrast, if you haven’t read the previous six novels, Horst’s parade of police characters and their departments and heirarchy can be confusing. But is Horst a writer? Stupid question, in one sense. He writes novels which are not only published but sell in many thousands. He’s an enviable commercial success, for goodness sake. He writes, he makes a good living at it. Perhaps the question should be, is he a good writer? Does his very prose delight? And the answer, judging by Closed for Winter, is no. Within pages we have from the author’s voice ‘an immense void’, ‘enthralling guests’, ‘inbuilt aversion’, ‘bottomless despair’, ‘senseless violence’ and ‘any shape or form’. A full-on attack of clichés and adjectives which do worse that add nothing – they are a positive irritation, cluttering the page and distracting from the words which matter. Elsewhere there is exposition – passages where we are told what would better be revealed to us through action and dialogue – and description feels clumsy and wordy. Take this passage: ‘Once more he attempted to phone Thomas Rønningen, but was again connected to an answering machine. Intending to leave a new message, he nevertheless decided to hang up and send a short text message instead’. This means that Wisting rang Thomas Rønningen’s mobile again but he still wasn’t picking up so he sent him a text. Does it not? This sort of clunkiness causes the narrative to lose pace, even become plodding. Maybe Anne Bruce’s translation does not serve the text well, or perhaps Horst’s editors lack spine, but ultimately Horst himself is responsible. There may come a point where the reader loses patience, which is a shame. Wisting is likeable if a bit bland, the dénoument is satisfactory if you can hang on that long, and boyfriend Tommy turns out to be a half-decent bloke after all.